Ben Saunders vs. Douglas Lima II went down almost exactly like Ben Saunders vs. Douglas Lima I, except this time Saunders was knocked out with Lima’s foot and leg to his shiny dome, rather than Lima’s fists knocking out Saunders. 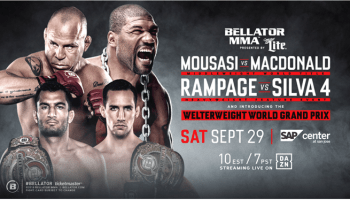 It was a beatdown, to say the least and even though I thought Saunders would do better in this season 8 Bellator finals – he didn’t. At least we got an awesome highlight out of it.